You are here: / Uncategorized / The Dungeons & Dragons Gift Set is a must have! Need a refresh on your well-worn copies? Have a friend who is itching to get into the game? Want a super-handy case to hold all that D&D goodness? 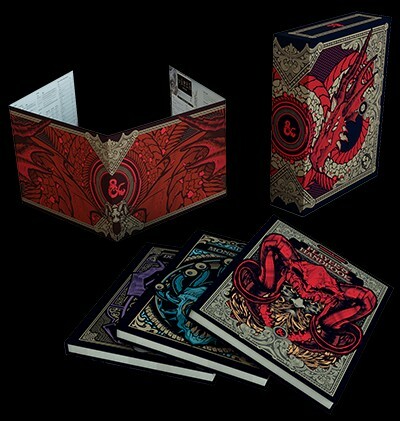 The Dungeons & Dragons Core Rules Gift Set includes a copy of all three core rulebooks and a Dungeon Master’s Screen, everything you need to create and play adventures of your own in the world’s greatest roleplaying game. This Gift set is offered in regular covers and alternate art covers. Both editions come with slipcover. Previous Post: « Star Wars Armada to release Super Star Destroyer!